Nick Rizzo is the Democratic District Leader for Williamsburg and Greenpoint. His tweet caused a backlash of people accusing him of being anti-Semitic. Instead of responding to the challenge of facts, Rizzo responded that “only” 40,000 of his constituents were Hasidic. RIzzo doesn’t seem to be concerned about the FACT that there have been multiple incidents in his own district, where bicycle riders have slammed into people exiting school buses – despite having their red flashers on. Apparently, two other District Leaders contacted Rizzo to complain over his tweets. 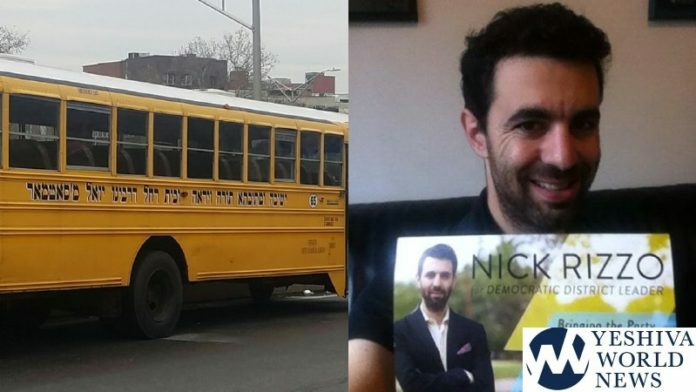 YWN notes that Nick Rizzo was a staunch supporter of Julia Salazar, the blatantly lying socialist who claimed she was Jewish – but was nothing of the sort, who went on to win a race for NY State Senate. In fact, Rizzo’s Twitter account still has an image as the header announcing “Julia Salazar for Brooklyn”. Salazar is a supporter of the anti-semitic BDS movement. I think I’m likely to die in an extremely Brooklyn way, whether that’s getting hit by a Hasidic schoolbus while riding my bike or a heart attack while arguing with a pseudonymous southern Brooklyn twitter account. I have no idea why about 70K of your constituents deserve this. Can you tell me when a Hasidic bus killed a cyclist, ever? 1) those ethnicities don’t have special schoolbuses! 2) I am not frightened of how any of those ethnicities’ drivers treat me on Bedford Ave! Seriously, watch that last tweet be the “proof” I’m anti-Semitic from now on. What, exactly, is a Hasidic bus? Maybe Rizzo is mistaking snow tires or chains for a beard?? It may be anti-Semitic, but if you see the way these busses are driven, you’d know he has a point. He’s not anti-Semitic, he just reads yeshiva world. Its no different then someone saying the same thing about school busses in any other town like , monsey, kj, lakewood ,brooklyn which have an over abundance of school busses in relation to the sq mileage of said town. Blow through stop signs, fail to yeild etc.. so yes, it highly likely to get killed by one of those busses. Instead of facing the issue head on, your always pulling the anti semitic card. Its like the boy who cried wolf one too many times. The anti semitic song is quite frankly getting old. Try singing s new tune for a change. This is getting ridiculous already. No one can say anything anymore without being called an antisemite, racist or phobic. All this guy did was complain how the buses drive. How does that make him an anti semite? The issue is that in our world of hypersensitivity, all criticism of any ethnic group – true or not, has been banned. The only group that it is ok to criticize is Hasidic Jews. So yes, this is scary because if the same was true about Black, Middle Eastern or Hispanic school bus drivers, you would be a racist for expressing it, but since it is about Hasidic Jews it is ok to express it. In other words, it is the contrast which makes this scary. Also Im not denying that he is antisemitic (as he supports BDS), I’m just saying the way these Hasidic school buses drive is atrocious. Did you actually read ALL the tweets in the article? I would agree if the only problem was a comment about the school bus. We see here on YWN how hasidic busses are driven. YWN had a video yesterday of a Hasidic school bus blowing thru a red light in Brooklyn. Actually, Tango is right. I have been mistreated on the road by bus drivers of all ilks, Jewish and lihavdil non-Jewish alike.